The term polymer is sometimes taken to refer to plastics, it actually encompasses a large class of compounds comprising both natural and synthetic materials with a wide variety of properties. Because of the extraordinary range of properties of polymeric materials, they play an essential and ubiquitous role in everyday life. This role ranges from familiar synthetic plastics and elastomers to natural biopolymers such as nucleic acids and proteins that are essential for life. Natural polymeric materials such as shellac, amber, wool, silk and natural rubber have been used for centuries. A variety of other natural polymers exist, such as cellulose, which is the main constituent of wood and paper. 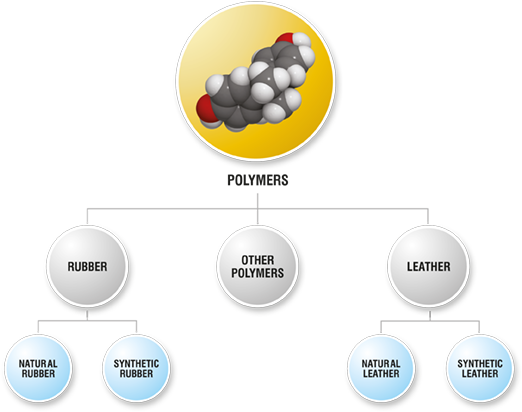 The list of synthetic polymers includes synthetic rubber, Bakelite, nylon, PVC, polystyrene, polyethylene, polypropylene, polyacrylonitrile, PVB, silicone, and many more.